Remember when a motorcycle dealership was a place you escaped to, not from? Welcome to the new Oliver’s Motorcycles website. The Oliver family has been running dealerships since 1971. The only match for our experience is our passion for delivering quality new and used bikes. And it’s not just the family that shares this passion, we have a dealership full of team members that have are actively involved in all aspects of motorcycling, from professional racing through to social riding on the weekend. Our passion has driven us to become a major player, and one of the most progressive dealerships, in the field. The last four years we have well and truly made our presence known, 2015 and 2016 we were awarded the title of Triumph’s #1 Dealer in Queensland. Alongside this massive accomplishment we have taken on board the Vespa and Piaggio scooter range, as well as the Husqvarna Motorcycle range. 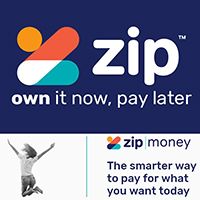 We now accept Zip Pay In-Store for Parts & Accessories and Servicing.